During the last few weeks of my brief relocation to Atlanta, I craved Coca-Cola cake. Not because I saw it on a menu or because somebody mentioned it, but because you can’t travel an entire block in Atlanta without seeing some sort of reminder that it’s the home of Coke, and my mind heads off in unpredictable directions when it gets a prompt. Atlanta, the home of Coke, leads to Coca-Cola cake. Why not? I remember eating Coca-Cola cake on a pretty regular basis when I was a kid. It’s pretty easy to throw together, and since you bake it in and serve it from the same pan, the presentation is simple, too. I’ve had a copy of Classic Cooking with Coca-Cola for years, apparently always meaning to make this cake, but I got very confused when I tried to look up the recipe. I found three recipes for chocolate cakes containing Coke, but none of them called for the 13-by-9-inch pan that I specifically remembered. Online, Southern Living linked to a recipe that called for a good bit more sugar than the one in my book (not that I’m trying to make a low-sugar cake, because LOL low-sugar cake, but I didn’t want a chocolate cake in which the sugar overwhelmed the chocolate). Finally, I flipped through my copy of The Mississippi Cookbook, figuring that the Southern classic would surely hold the recipe I was looking for. I found that the sugar-cocoa ratio in its version was even more unappealing than the one in the online recipe. Other than the sugar discrepancy, the online recipe’s ingredient list was nearly identical to one of the recipes in Classic Cooking with Coca-Cola, AND the online recipe gave me instructions for baking in a 13-by-9-inch pan instead of a sheet pan, so I figured my baking time would be about the same. And it was. As I remembered, the cake was at its best the day after I made it. 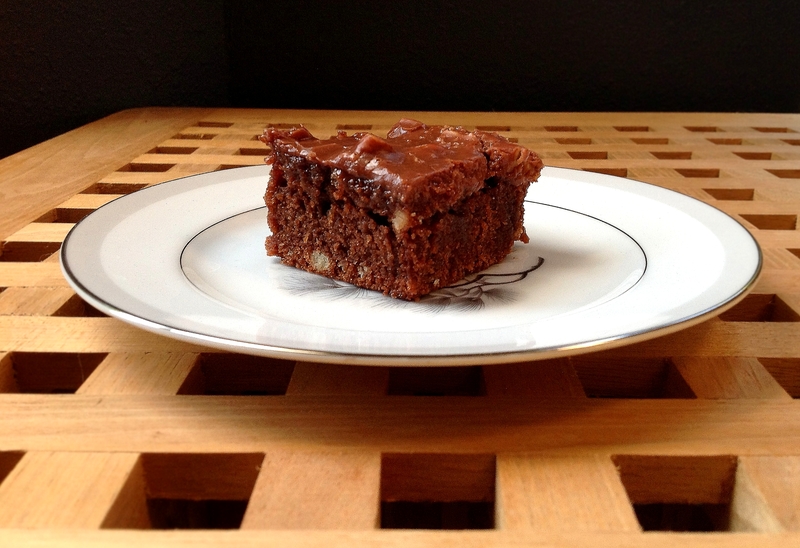 As the icing sits overnight, it hardens into a fudgy topping — not quote a hard coating, but not a soft frosting, either. 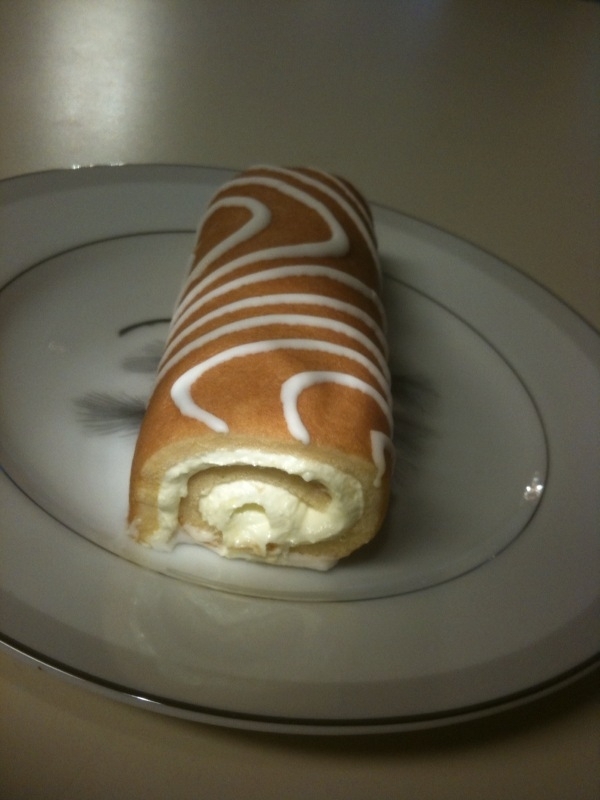 Admittedly, this cake was not the ambrosial concoction I remember from my childhood, but it was quite delicious. I think cake, like sandwiches and salads, is simply one of those treats that always taste better when somebody makes them for you. One regular can of Coke is enough to make the batter and the icing, provided you don’t drink the leftover soda while the cake is baking. I’m not judging, either way. And seeing as I have NEVER purchased a carton of buttermilk, I always have to use the standard substitution: 1 tbsp. white vinegar or lemon juice to 1 cup milk. I also understand you can use yogurt or buttermilk powder. Start making the icing a couple of minutes after the cake comes out of the oven. You’ll want to pour it on top of the cake after the cake has cooled off for about 10 minutes. Also, the original recipe indicated that the pecans in the icing were optional, and pecans are SO not optional for this cake. In fact, I might try to work some pecans into the batter AND the icing next time. Grease and flour a 13-by-9-inch pan. Preheat the oven to 350 degrees. In a saucepan, bring the butter, cocoa and Coca-Cola to a boil. 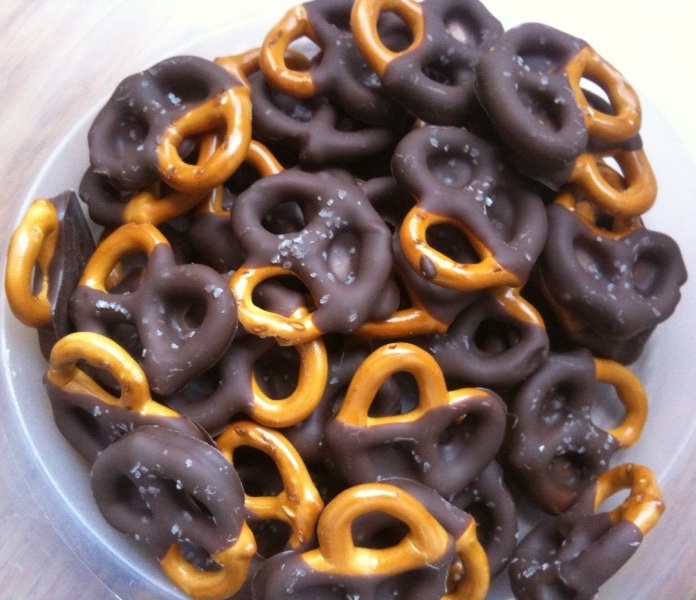 Pour this mixture over the flour and sugar and stir until the batter is mixed thoroughly. Stir in the buttermilk, eggs, baking soda, vanilla and marshmallows; mix well. Cool the cake in the pan for 10 minutes on a wire rack, then pour the icing on top. It should spread itself out pretty evenly over the cake. Let the iced cake sit for at least an hour to let the icing firm up a little before you cut it, or risk scraping icing run-off out of the bottom of the pan with a spoon (which, really, is not such a terrible thing). 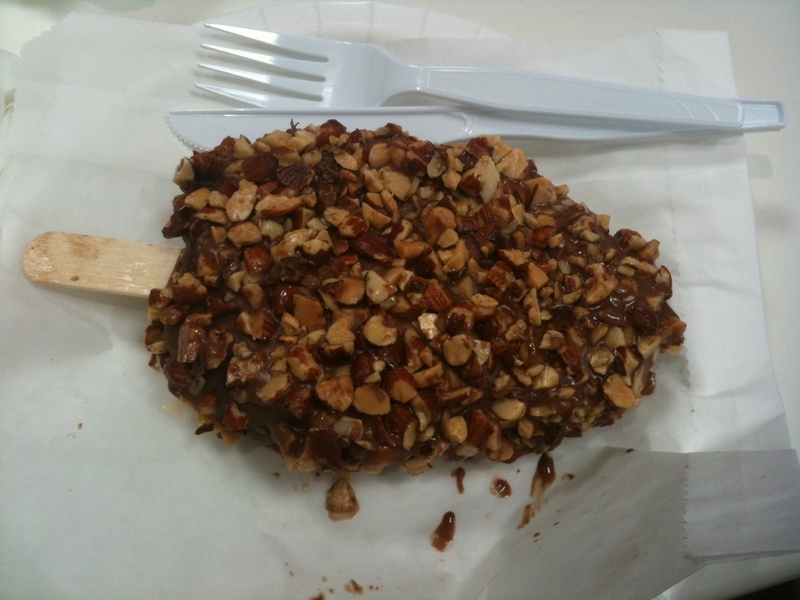 Six-week-old craving for a hand-dipped ice cream bar from Costco: satisfied. I got cake balls right this year. I followed Bakerella’s instructions, for the most part, but I also scouted around on a few other food blogs to try to improve on my last effort. Chill the undipped cake balls in the refrigerator for a couple of hours to get them firm enough for dipping. If you’re in a hurry and decide to pop them into the freezer instead, prepare for cracked cake balls. I only used the refrigerator for this last batch, and I had exactly ZERO cracked cake balls. More than half of the previous batch, which all went into the freezer so I could dip them more quickly, cracked within an hour after dipping. Plan ahead and leave yourself plenty of time. 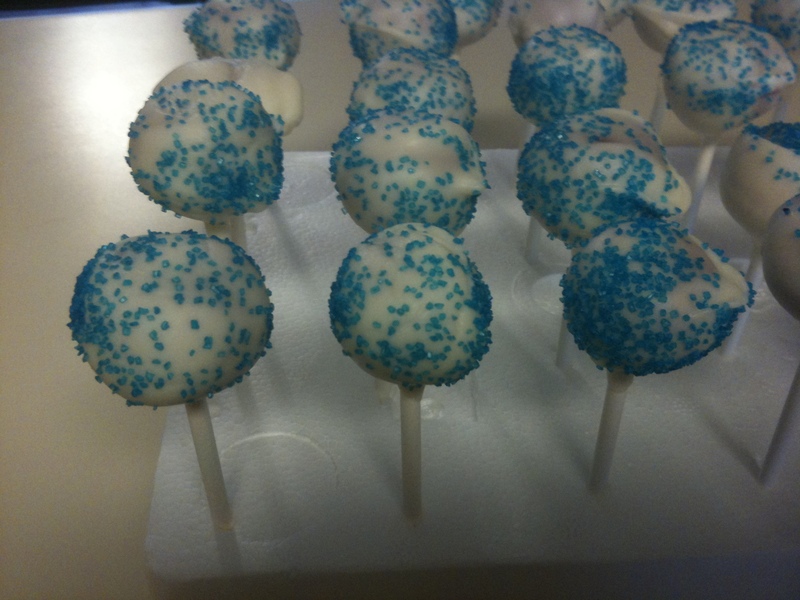 Put the refrigerated cake balls on lollipop sticks before you dip them into the melted chocolate coating. This technically turns cake balls into cake pops. Go with it. Dip the tip of each stick into the melted coating before inserting it into a cake ball, then put the cake balls back into the refrigerator for at least five more minutes. The lollipop sticks make the coating process a lot easier, and, if you heed the advice in steps 3 and 4, they give you a more professional-looking product. Melt the chocolate coating in the microwave if you like, but hold it over simmering water in a double boiler to keep it thin enough while you’re dipping the cake balls. This will make the dipping process go faster, since you won’t have to worry about thickened chocolate that has to go back in the microwave every few minutes. Maintaining the melted coating at the same consistency throughout the dipping process simply results in prettier cake pops, too. After dipping the cake balls in the melted chocolate coating and letting the excess drip off for a few seconds, drizzle the wet cake balls with colored sugar or sprinkles — if that’s your decor of choice — and stick the clean end of the lollipop stick into a sturdy piece of Styrofoam (you may want to poke tiny holes in it before you start so the sticks will go in easily). This eliminates the flat spot and messy melted chocolate spread on the bottom of the finished cake balls. I covered the business end of most of the cake pops with a small, clear treat bag and secured it with a small piece of Christmas ribbon, quickly tied into a simple knot (you can also just use twist ties). This made the cake pops fancy AND portable and helped keep them fresh for the better part of a week. I won’t lie. These take forever and a day to make, and you’ll be cleaning chocolate smears off your stove and countertop and sweeping colored sugar off your kitchen floor for days. 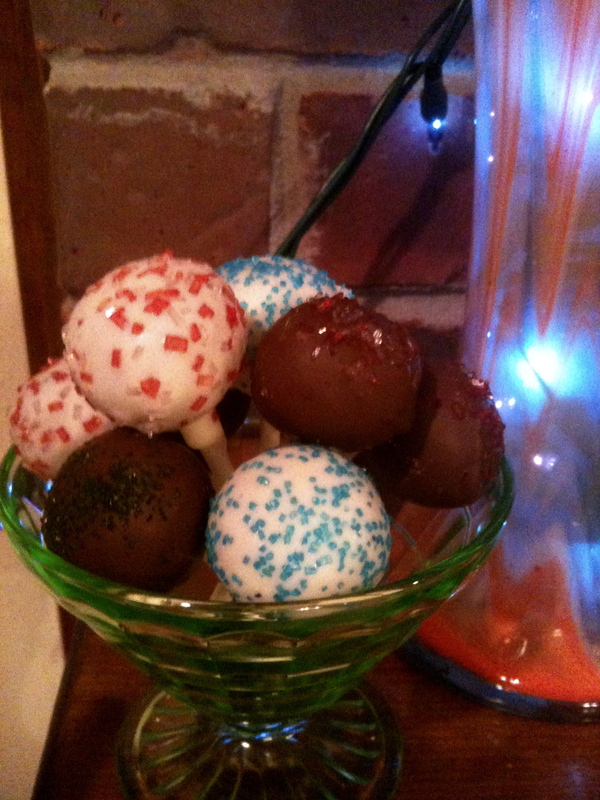 But well-made cake pops are beyond delicious and will impress the heck out of most people. Especially the 5-year-old princess fanatics in your life. It should not be this easy to satisfy a chocolate craving, and yet it is. It’s not pretty by any means (thus the lack of a photo for this post), but this recipe for Gooey Chocolate Mug Cake actually makes a pretty passable one-serving instant brownie, using only powdered sugar, cocoa and an egg. Best of all, you mix it and microwave it in a coffee mug, leaving little mess behind.